The explosive advancements in mobile Internet and Internet of Things challenge the network capacity and architecture. The ossification of wireless networks hinders the further evolution towards the fifth generation of mobile communication systems. Ultra-dense small cell networks are considered as a feasible way to meet high-capacity demands. Meanwhile, ultradense small cell network virtualization also exploits an insightful perspective for the evolution because of its superiority, such as diversity, flexibility, low cost, and scalability. In this paper, we specify the necessity of resource management in virtualized ultradense small cell networks through a mapping and management architecture, and consider the problem of user-oriented virtual resource management. 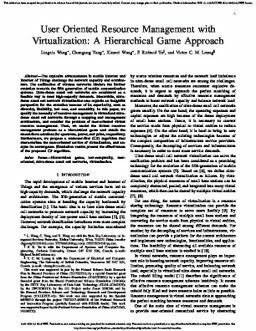 Then, we model the virtual resource management problem as a hierarchical game and obtain the closed-form solutions for spectrum, power, and price, respectively. Furthermore, we propose a customer-first (CF) algorithm that characterizes the user-oriented service of virtualization, and analyze its convergence. Simulation results present the effectiveness of the proposed CF algorithm.